African immigrants living in Europe typically have a far higher standard of living than their counterparts in Africa. They also have far more rights, privileges, and entitlements. This is why they go to great lengths to try to move to Europe. However, the resolution makes wild unsubstantiated conspiratorial claims of Afro-Europeans being oppressed, mistreated, and targeted for crimes. Christ trurhfully said “by their fruit ye shall know them”, so what is the fruit of african behavior. Africans pushed for independence, got it, and then destroyed their countries. My black grandmother who spoke both French creole and English used to say, “when god made black people he used his foot”. My Haitian friend of similar mind is adamant that no amount of aid or money can fix Haiti because the culture will not allow improvement. Culture creates the person, and expands or limits his/her capabilities and horizons in everything they are or do. So Africans are a product of garbage cultures, which produce garbage people, who then become a liability on the human race with every garbage thought they think and garbage deed they do. A lifetime of experience has shown me that the concept of “the white man’s burden” which used to personally offend me, is a statement of fact. But it is an impossible burden, and while I am amazed that christian white people have carried the burden so far, it has only gotten heavier over time with the increase in ignorance among blacks due to their hostility towards mentation. Thus I think whites should drop the burden, see to their own interests, and not allow a bunch of zionist controlled polititians destroy their countries thru massive import of blacks with the goal of drowning the european culture in ignorance to create a lower average I.Q. population that the zionist NWO can more easily control. They must let go of the guilt that zionist media has installed in them thru the method of constant daily lies – the same method used to brainwash the credulous with the Russia collusion presidential coup attempt. 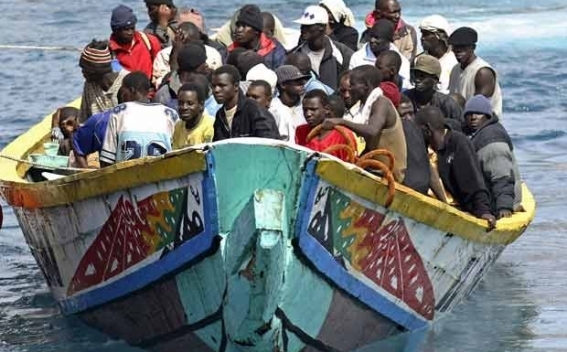 These boats from Africa, paid for by zionists like George Soros, must be stopped and turned back. Then legislation with serious fines, jail time, and property confiscation, passed to punish any attempt to restart it. Then alien criminals returned to their countries after serving their sentences. Then an e-verify system to verify immigrant status of all employed people implemented. Then daily raids to seize illegals and return them to their countries. Then threaten to publicly expose all the millions that current leaders in these countries have abroad unless they stop the illegal waves. Then dock so many tens of thousands from foreign aid money for EACH person from that country caught attempting illegal entry into Europe. Then tie foreign aid to christian education as only this prepares the human mind for productive life that elevates a nation. This is because Christ revealed God’s BLESSING (not curse as too many have erroneously believed) upon mankind when he said, ” by the sweat of thy brow shalt thou eat bread”. In african (and arab) countries people want bread without work, thus riddling these countries with corruption for “easy money” from top to bottom. George Soros was born a Jew, but that’s it. What about all the Christian leftists that keep flooding our countries with refugees? What about the UN that has been hijacked by Islamic SUPREMISTS who are enabling all this mass immigration? What about the Pope that keeps encouraging immigration, although Islamic Supremists are killing Christian’s, Jews, Hindus and ANY AND ALL Non-Muslims? This is well explained! Where I live I came to the same conclusion after seventy five years experience in S.A.. They got there own land and don’t take in! Let them show the world that they can do better than us! Don’t feed them so that they can produce their own food! They must prove that they are really superior then we can appreciate the chance! Guy Leven-Torres on Only the French rejected an EU resolution to give Afro-Europeans special treatmentSuperb! Farage: Do you really want me back?